Obsessed with social media strategies of classical music institutions, I made yesterday this little survey of Facebook power of major opera houses in the World. To do that, I compared the numbers of fans (which equals to the numbers of like of an official Facebook page) of more than 60 opera houses in the World. This surveys of the numbers of fans of opera houses in the world s complemented another survey I made on Twitter ! 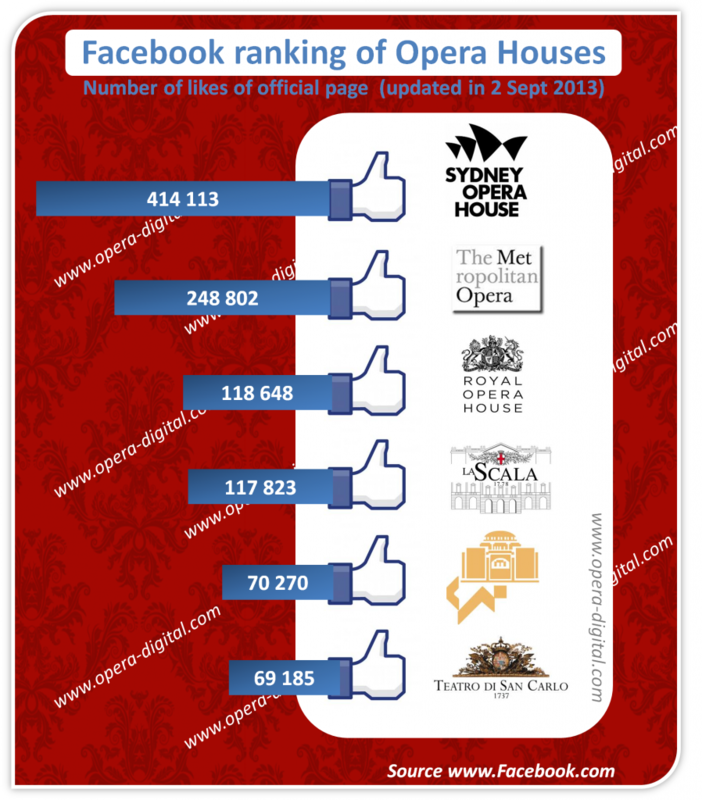 As for the number of Facebook fans (measred on 28 August 2013 and updated on 2 September 2013), I expected that Opera houses located in English-speaking countries would lead the race, like in the Twitter’s ranking. However, there are a few exciting surprises on this Facebook ranking ! Here is below this infography ! The undisputed champion on Facebook is the Sydney Opera House with more than 413 000 fans. The second opera house is the New York’s Metropolitan Opera with about 250 000 fans ! Third is the London’s Royal Opera House (which is by the way 1st regarding Twitter’s followers). La Scala ranks 4 (which ranks 3rd as for numbers of Twitter followers) and is the most placed opera house located in a non English-speaking countries. The biggest surprise for me comes from the number 5 ! Interestingly, the beautiful Cairo Opera ranks 5 with 70 000 fans a little bit ahead of Napoli’s Teatro San Carlo (another Italian Opera House) that boosts 69 000 fans. The ranking show a lot of gap between the opera houses with a “5 to 1” ratio between the first (410000) and the sixth (70000)! This entry was posted in Institutions & Digital and tagged comparison, facebook, ranking, social media, social network, twitter by Ramzi SAIDANI. Bookmark the permalink. Il me semble que le Berliner Philarmoniker devrait figurer dans ce ranking (avec ses 422K fans/like) mais je ne le vois pas ! Hello Sebleo ! You’re right to say that Berliner Philharmoniker has more than 420K facebook fans ! Still as this ranking focuses on opera houses, it’s thus logical that it doesn’t take the Berlin Philhar into account 😉 !